The Healthcare Purchasing Network (HPN) is a buying group committed to providing our members with superior customer service and contracts with vendors that can provide high quality products and services at reasonable prices. While most buying groups focus on just supplies for their particular membership base, our goal is to provide our members with goods and services to not only improve the operations and profitability of their practice, but also assist them in growing their practice through marketing recommendations, innovative ideas on new patient/client recruitment and patient client retention programs. Kazimi's Restaurant features Mediterranean and American Cuisine in a fine dining atmosphere. The friendly and dedicated staff make guests feel welcome and provide a memorable dining experience. Top of the Mountain Creations features an eclectic variety of items for sale on eBay. The items range from handmade cross stitch items, new and used Stampin' Up items, toys, housewares, brand new medical supplies, and much more! New items are added all the time so make sure to check back often. NEPA Partners, LLC is a joint venture of Beau's Peeps, LLC and Lisman Holdings, Inc. NEPA Partners specializes in the commercialization of products in late stage development for the retail medical, home healthcare markets and selected consumer product segments. NEPA Partners has extensive experience in manufacturing, sourcing, finance, marketing and sales. The See 4 Safety Mobility Light is a new, innovative product from NEPA Partners . The compact, patented light provides automatic, hands-free illumination for users of walkers, canes and rollators. The See 4 Safety Mobility Light provides users of walkers, canes and rollators with an easily attached automatic light source. The light turns itself on when in motion and when it senses a low level light environment. The “intelligent” light turns itself off after 30 seconds if there is no motion or when it senses a well - lit environment. The patented, hands - free, automatic illumination is the only personal visual aid that knows when to turn itself “on” and “off”. 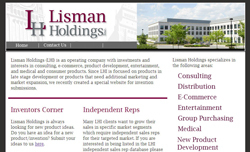 Lisman Holdings (LHI) is an operating company with investments and interests in consulting, e-commerce, product development, entertainment, and medical and consumer products. Since LHI is focused on products in late stage development or products that need additional marketing and market expansion, we recently created a special website for invention submissions.